BOSS MODE is a trend catching setup, meaning it was designed and built to get you in and out of the trend. The reason for this is because most pips are made while catching the trend.Inside theOscillator window you will see the Range indicator. line especially if the Oscillator has just changed as well. The drawback to using this indy is even though it is great at showing us when to get in onthe start of a new move, it is much harder to see continuation moves with this indy. Not to worry. The histo indy that is in the window above the Oscillator is a filter indy :-) This will work hand hand with the range indy to show us continuations in the current trend as well as an exit strategy if you are not already out of the move, if the filter goes against you then it is time to exit.Also the filter indy will help you decide if its a good time to get in. The higher gann ssl which will show you 4hr on 1hr & 30m chart and daily on 4hr chart. 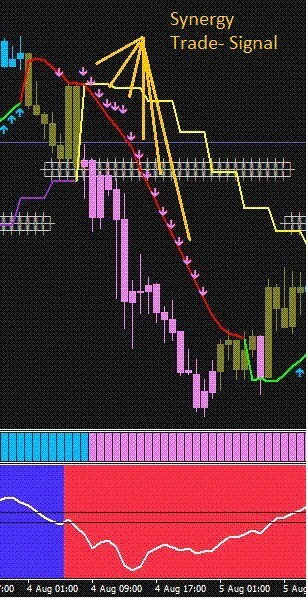 Trading with the higher time frames is preferred. The smaller Gann ssl is part of your trigger. You want to be in a red smaller gann ssl tolook to sell, and in a green smaller gann ssl to look for a buy. You want to be in a red small gann ssl with in a yello big gann ssl to sell, and in a green sslwith in a purple big gann ssl to buy. going short. It is there as a confidence booster. Just watch it for a few days and you will see why. In the picture XPS v8 and Synergy trading signal in action. when it does it's cross. A Flat Range line is a weak signal. broke thru before you enter a trade. afterwards, but then on the next candle you don't. or even stoped. So this is something to keep in mind. this setup, please let me know. But as for me, I try to keep it as simple as possible.So what I look is how much price has moved across the murrey math map. start going in the other direction. Murrey math. The 1/8 and -1/8 area and beyond. Now I'm looking for signs of weekness. Like a double or triple bottom. strive for around 60 pips. trade I let the second run until the candles change color against me. This is just my style of trading, you should do what works for you. account from being wiped out from some freakish news. The whole point of me doing this is that I want to get out if the trade goes against me.